Budget credibility is the ability of governments to accurately and consistently meet their expenditure and revenue targets. Many governments around the world struggle to implement their budgets, including Nigeria: the country’s federal budget was underspent every year between 2009 and 2016, with the share of underspending as high as 27 percent in 2016. When we presented this data at a recent multi-stakeholder Budget Credibility Community of Practice meeting convened by the International Budget Partnership (IBP), massive underspending of the Nigerian federal budget was blamed on fluctuating oil prices and oil revenues. 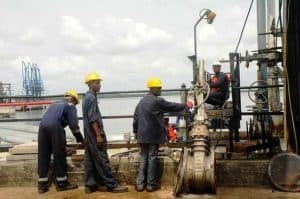 This is common when it comes to Nigeria, and many people, from those who know relatively little about the country to country experts, would be inclined to agree that volatile oil resources are at the heart of Nigeria’s broader political and economic challenges – and specifically, its failure to spend its budget. IBP and the Nigerian advocacy group BudgIT recently released a paper that attempts a comprehensive review of budget credibility challenges in Nigeria between 2009 and 2016. While we found that oil revenue does play a role in Nigeria’s low budget credibility, the majority of the problem is explained by other factors. Here are some of our key findings. 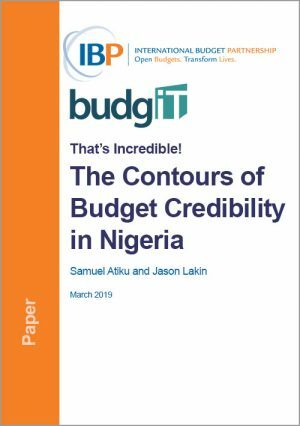 Download our paper, That’s Incredible: The Contours of Budget Credibility in Nigeria to learn more. While oil revenue accounted for 60 percent of total revenue in Nigeria between 2009 and 2016, in only two of those years – 2010 and 2011 – was oil the majority factor in the under-collection of revenue. Rather, underperformance of customs revenue and “independent revenue,” which in Nigeria mainly refers to fees and services charges collected by independent agencies, together accounted for more than half of under-collection in most years. Poor oil revenue projections were not mainly driven by poor price forecasting, but by poor production forecasts. Ambitious revenue projections are a key factor explaining poor budget credibility, but aggressive expenditure projections also play a role. For example, in 2010, revenue was projected to increase by 42 percent, and was under-collected by 8 percent. But expenditure was expected to increase by 70 percent, and underspending was 22 percent. Clearly, both revenue and expenditure projections were too high, but the expenditure projections were significantly higher and led to significantly more underspending. Ambitious expenditure projections are rooted in both executive action and legislative amendment powers. 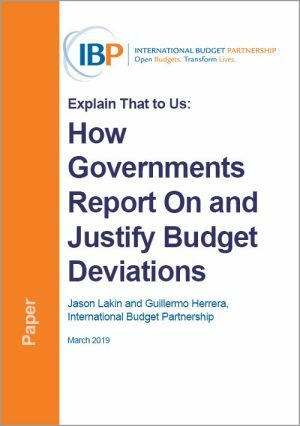 The data show that legislative amendments tend to exacerbate underspending by introducing additional projects into the budget that cannot be implemented. For example, in 2010 the legislature introduced nearly one trillion Naira of underspending (if we compare actual expenditure to the original budget versus comparing it to the budget as it was amended by the National Assembly). However, the legislature’s role is complex: in 2012 they decreased the executive’s budget proposal, reducing underspending, and in 2015, the increases they made introduced underspending but led to a larger and more realistic budget overall. Perhaps unsurprisingly, the biggest credibility problem in Nigeria is on the capital side of the budget. A majority of underspending is related to capital expenditure in all of the years between 2009-2016. Not all agencies underspend their capital budgets – on average, the Office of the Presidency and the Ministry of Sport overspend their capital budgets. A majority of the underspending on capital is related to the economic sector, affecting major infrastructure projects in transport, energy, petroleum, and so on. The data nevertheless show important variations within the economic sector. For example, the Ministry of Works and the Ministry of Power exhibit less underspending compared to the Ministries of Petroleum Resources, Trade, and Investment, and Labour and Productivity. To what extent is underspending on capital in Nigeria driven by unrealistic budgeting and to what extent is it driven by implementation challenges when agencies receive funds but cannot spend them? Both problems exist in Nigeria, but unrealistic budgeting is the larger of these. In 2013, agencies spent 92 percent of the funds released to them, but only 58 percent of their budgets, meaning most of the underspending was due to funds that agencies never touched (only 8 percent of the funds actually received remained unused). Nevertheless, in some years, underspending against releases was particularly poor. In 2012, underspending against releases was only 67 percent, and in 2014, it was 81 percent. Thus, Nigeria is a case where budgets are unrealistic, and also a case where money that is available to ministries is often left on the table. These findings demonstrate that while oil is an important factor in Nigeria’s low budget credibility, the country also suffers from other typical budget formulation and implementation problems that cannot be blamed on oil directly. Of course, more research is needed to understand the nature and impact of low budget credibility in Nigeria. Future research should attempt to understand exactly which capital projects are driving poor budget credibility, and the extent to which these are projects inserted into the budget by the legislature or by ministries and agencies. We could also understand better the drivers of poor implementation when funds are actually available to ministries. Finally, we need to learn more about the impact of poor budget credibility on the geographical distribution of resources across the country and its impact on equity. Budget Credibility: Is the Government Doing What It’s Saying and Saying What It’s Doing?